Am all tumbled and jumbled. I figured I would just make some SF pictures to maybe right myself. 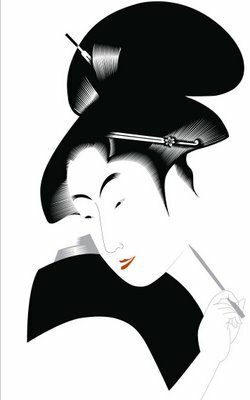 These portraits are getting me all worried and confused.So as a bit of medicine, I figured I would research lovely asian ideas and art. Utamaro is a long time favorite--so the incomplete image above is a bow and wave to him. The stick in her hand will either become a brush or a pencil...perhaps a SF skyline hair ornament...And A golden gate bridge pattern in her dress. I am editing the crap out of this thing...reducing line and color which I think looks pretty good. The hair has been fun..so I am charged despite my personal confusion. Daruma dolls (達磨 daruma? ), also known as dharma dolls, are hollow and round Japanese wish dolls with no arms or legs, modeled after Bodhidharma, the founder and first patriarch of Zen. Typical colors are red (most common), yellow, green, and white. The doll has a face with a mustache and beard, but its eyes only contain the color white. Using black ink, one fills in a single circular eye while thinking of a wish. Should the wish later come true, the second eye is filled in. It is traditional to fill in the right eye first; the left eye is left blank until the wish is fulfilled. "The first Dharma dolls are said to have been made some 300 years ago at the Sorensen Dharma Temple in Takasaki City in Gunma Prefecture, modeled after the Zen monk, Bodhidharma. The eyebrows and beard represent the crane and the turtle, long considered symbols of longevity in Japan, and the dolls are popular as good luck charms. It is traditional to paint in the left pupil (the right one facing you) when you make a wish, and then paint in the right pupil when the wish comes true. Also, it is said to be most lucky to place the doll so that it faces south. In Japan, red and white are considered lucky and these are the usual colors for a Dharma doll. There are other dolls with different colors, based on oriental astrology, so you can select the color of the doll based on the nature of your wish and your lucky color, increasing the fun and perhaps the efficacy of the charm. " Chad mentioned that part of the Daruma doll concept was to hold the pure idea of the Daruma and draw it without looking. He said: "I really like the darumas. They represent Bohodidarma who founded Zen Buddhism and is credited with creating martial arts. When you do it, try and detach yourself from it and create it with a pure mind free from opinion of self. It is an amazing exercise. Really, try it." "so express from your heart and let the pen do the work. Its all about sincerity and intention." So, I am fascinated with a mini sketch process of these little wonders that promise action, a journey, a wish. There is something truly wonderful in these personal commitments, reminders of promises. I seem to be fascinated by asian good luck symbols--from the Daruma and the Happy or Lucky Cat and the various Hariko figures. Maybe some simple fun illos of these guys before I get with the portraits...? Back to work. R. should be home in an hour or so.